Disclaimer: Spike and Buffy are not mine; I just enjoy stuffing them into tiny boxes. Summary: 43 Spuffycentric haiku caps from BtVS, S5, "Crush." Twelve parts. A/N: Written for the Fall 2008 round of seasonal_spuffy. (Original post here.) Shout out to enigmaticblues for keeping that shindig going, and big thank yous as well to Mister Beta for haiku-wrangling and to philips for amoral support. Fabulous banner courtesy of the awesome and generous alwaysjbj. Feedback is part of a balanced breakfast and also very delicious. Slayer all undefended . . .
time to make a move. Bit leans in closer . . .
crypt plus vampire equals bad. Hears the words, but . . . huh? a flask of bourbon and thou . . .
birds go for that, right? gives way to naked panic. without her flippin’ her wig! the bogus suspects. The flask! (gulp) Is this a date? he can be good, too. but death on two legs. it is kind of flattering . . .
Run! Do not pass go. stops dead in her tracks. what is it he sees? Gorgeous work as per usual. Fabulous!! 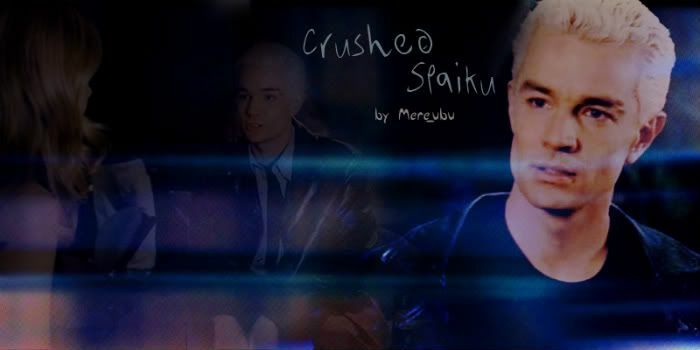 Love your 'Crush' Spaikus when all together or separate. Aw, thank you so much, Louise! *hugs* I'm glad to know that it holds up to a repeat reading. Hee! I so love that moment when he loses it and starts ranting. *pets Spike* He's probably about as far from coolness at that point as William is. Egads!! I miss that show. Thanks for reading, lady! I'm delighted that you enjoyed them. I didn't start watching until the series was already over, and I wish I'd been in the fandom during its heyday. *sigh* Such a shiny show! It's a novel in spaiku! Poor manpire. He fell into the gap; oh the humanity! *lol* I still don't know how I ended up with so many of the darned things! Now I'm worried that people will point and sneer when I revert back to my usual posting rate of 2-4 haiku every couple of weeks . . .
*shakes head* So much awesome. "Crush" is one of my favorite eps! I love watching Spike try to figure things out. He tries so hard to do all the right things and he gets no credit. Makes me just want to take him home and cuddle him. I love the Jiffy Pop comment! I noticed that last night when I re-watched the ep with the kidlet. I kept waiting for the silver dome to explode but that would've broken the dramatic tension. Aww, thank you! **bows sheepishly** Heh. I'm so pleased that you liked these, especially since you're coming from the perspective of a very recent re-watching of the ep. Although I can totally see why Spike's actions here shouldn't get him the girl, it's impossible to not feel sympathy for his earnest attempts and wrong-headed flailing. Poor confused guy! *nods* In a way, the attempt at "normal" dress is somehow worse than the Hawaiian shirt in "Doomed"; at least he protested the sartorial indignity there. Hee! I have to pause and go off on a little Jiffy Pop tangent every time I watch it. I actually have some around here somewhere, and I need to give in to my nostalgia and make it already. Happy almost-Turkey Day to you! Your fic(s) have been nominated for Round 9 of the Rogue Poet Awards (http://awards.rogue-poet.com/). This is a relatively small award site, predominantly Spike/Buffy. Nominations for Round 9 will run from April 1, 2009 - May 31, 2009. Winners will be announced on June 30, 2009. Please feel free to stop by the site. If you have a website/LJ and would like to snag a button to link back to the site - great! If not, that's fine too. They're not necessary to win. If you do not wish to have your fic(s) included, please reply to this notification stating so, and I will have your nomination(s) removed. If I do not hear back from you, I'll assume that you wish your nomination to stand. In that case, good luck! Aw, shucks. Thank you so much, sweetie! You keep writing such flattering senryu and you're going to turn me into a total monster of ego. Thank you so much! I'm glad you enjoyed them. always_jbj made the banner, and I'm thrilled to have it! I have zero graphics skills. Just absolutely cool beans in a cast iron kettle! My oh my, what could you say about home grown tomatoes? Thank you for tweaking these just right and sending them out to share with us. They are unique and twisty--clever the found one. I don't think I've told you how much I like the Ghoul, interrupted line. It's a pun, it's a cultural reference, it's Spaiku! Thanks so much for this. There are too many perfect phrases to enumerate here, but I savor every one of them.